I have started working on putting a few cards together for the craft fairs this fall. The wreath card below was the first. My friend Debbie has been helping me get digi stamps ready for cards as well. This is one of the first cards with a digi stamp on it (sorry I can't recall where I got the digi stramp right off the top of my head right now. 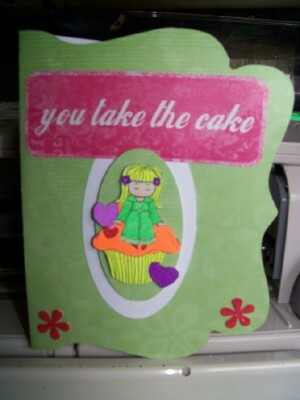 The card base is from the incredibly talented Wanda at http://wandascrafts.blogspot.com/. I love this card mom! I had to look as soon as I got home after you told me about it. I want to do something like this for my logo for my cakes...after all....CUPCAKES ARE TAKING OVER THE WORLD....at least in my kitchen...lol! Love you mom...keep up the good work. What a cute cute card!!!!! I just want THANK YOU so much for your sweet comment on my blog as well!!! I hope you are having a blessed day!! !